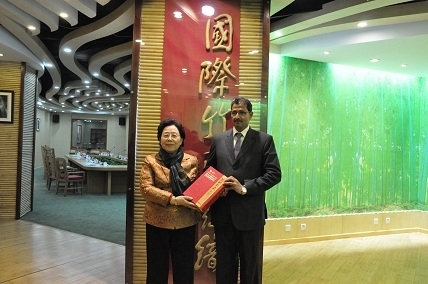 On January 15, 2016, Prof. Jiang Zehui, Vice Chair of the Committee of Population, Resources and Environment of Chinese People’s Political Consultative Conference (CPPCC), Co-Chair of the Board of Trustees of the International Network for Bamboo and Rattan (INBAR), and Director General of the International Centre for Bamboo and Rattan (ICBR), received a Nepalese delegation headed by H.E. Agni Prasad Sapkota, Minister of Forests and Soil Conservation, at INBAR Headquarters. They exchanged views in the field of bamboo and rattan, in particular on the cooperation on the use of bamboo in post-quake reconstruction. 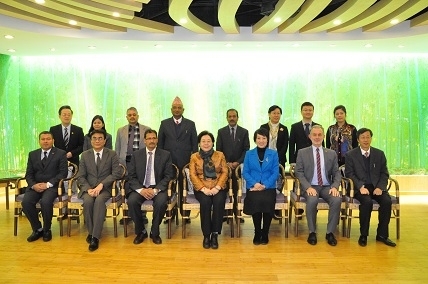 Also present were Ms. Zhang Hongyan, Deputy Director General of the Department of International Cooperation of the State Forestry Administration (SFA), Mr. Liu Shirong, Secretary of the Party Committee of ICBR, H.E. Mahesh Kumar Maskey, Nepal’s Ambassador to China, Dr. Hans Friederich, Director General of INBAR, and Mr. Li Zhiyong, Deputy Director General of INBAR. Prof. Jiang began by extending a warm welcome to H.E. Agni Prasad Sapkota for taking the time to visit ICBR and discuss China-Nepal bamboo collaboration during the China-Nepal Forestry Working-Level Meeting. 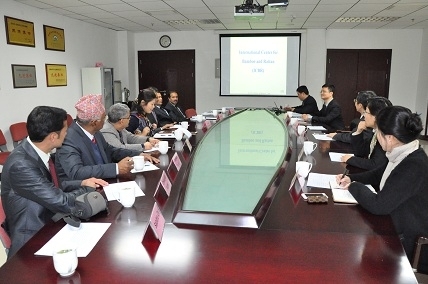 She briefed the visitors on the basic facts about ICBR and highlighted the cooperation between China and Nepal on bamboo and China’s development of quakeproof bamboo prefabricated housing. One outstanding cooperation project between China and Nepal regards the development and commercialization of bamboo-based panel prefabricated housing in Asia and Africa, a Common Fund for Commodities project undertaken by ICBR. Currently, the bamboo pre-process center and process center for this project are both in smooth operation. Using bamboo-based panel for prefabricated houses presents a new solution for environment-friendly quakeproof house building. Prof. Jiang also briefed on ICBR’s achievements in providing technical and management training for INBAR member countries. Since 2005, ICBR has trained over 20 Nepalese senior officials, corporate executives, and technical professionals. The training courses can better enable developing countries like Nepal to develop bamboo and rattan resources, grow their regional economy, and reduce poverty. H.E. Agni Prasad Sapkota thanked Prof. Jiang for the meeting and expressed his approval of the progress ICBR and INBAR have made in recent years in bamboo and rattan-related projects in Nepal. He extended his sincere gratitude for the technical support from China, especially for the immediate disaster relief from the Chinese Government after the earthquake took place in April 2015 in Nepal. The minister said that there are twelve kinds of bamboo in Nepal, and that the Nepalese Government takes the bamboo industry seriously. However, he regretted that Nepal is now mainly producing primary bamboo products and bamboo handicrafts for the domestic market only. Nepal is planning to plant bamboo in the green belts surrounding Kathmandu, the capital city. Nepal is also set to improve their cultivation and management of bamboo resources and make more efforts in capacity building and the development of high value-added bamboo products. In particular, they plan to use bamboo extensively in post-quake reconstruction. The Nepalese side hopes for continued technical and project support from the Chinese Government and INBAR to help them expand their bamboo industry. Dr. Hans Friederich expressed his gratitude for the sustained support for INBAR from the Nepalese Government, especially the Ministry of Forests and Soil Conservation. He also extended an invitation to H.E. Agni Prasad Sapkota and the Prime Minister of Nepal to attend the 2017 Global Bamboo and Rattan Congress to be co-hosted by INBAR and ICBR. 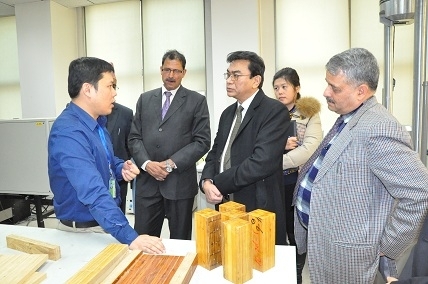 After the meeting, the delegation visited the Bamboo and Rattan Key Laboratories at ICBR and was shown to the International Bamboo and Rattan Showroom. 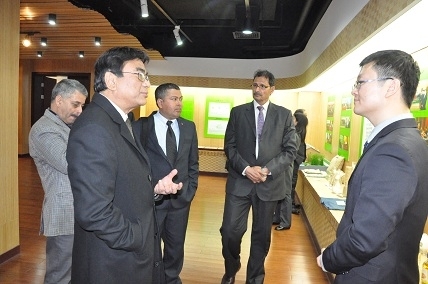 Mr. Liu Shirong led officials from the Department of International Cooperation of ICBR and researchers at ICBR to engage the Nepalese delegation in a discussion regarding cooperation areas, the processing and utilization of bamboo in China, and specifically the use of bamboo in quakeproof prefabricated housing. ICBR and the Nepalese delegation agreed to cooperate on bamboo and rattan-related technology transfer, capacity building, development of high value-added products, and commercialization of bamboo products.